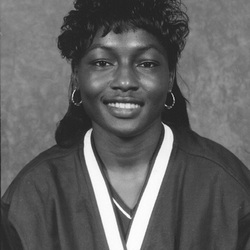 Yolanda came out of Miami Southridge High School on the fast track, having been named the Florida Dairy Farmers Girls Track and Field Athlete of the Year for 1994, after winning 4 state titles, including 2 her senior year; the 100 meter high hurdles and the 300 meter low hurdles, which she won three straight years. She would leave Miami with 6 All American honors and an NCAA Title! She gained her first All American honor in 1996 in the outdoor 100 meter hurdles. In 1997, she won the BIG EAST championship in the outdoor 100 meters, outdoor 100 meter hurdles and indoor 55 meter hurdles, becoming an All American in the last two events. She was named the 1997 BIG EAST Outdoor Most Outstanding Track Athlete. In 1998, she was redshirted to take part in her practicums for her major in nursing, but she didn't miss a beat when she returned the following year. She became only the 2nd female in conference history to win a second BIG EAST Outdoor Most Outstanding Track Athlete award. She claimed titles in the 100 meter outdoor hurdles, 400 meter outdoor hurdles and the 60 meter indoor hurdles, one of only 13 athletes in conference history to win multiple events in two or more BIG EAST Outdoor Championships. At the NCAA meet in Boise, Idaho, Yolanda would claim the National Championship in the 100 meter hurdles with a time of 12.85 seconds ! She was an All American in the outdoor 100 meter hurdles, and 60 meter indoor hurdles for 1999. She left Miami as an NCAA Champion, six time All American, and holding six school records, two are still on the books; the indoor 60 meters (8.04 seconds) and the 100 meter outdoor hurdles (12.85).